Mastering the ins and outs of Christmas pet photography can mean the difference between snapping a frame-worthy masterpiece and one that's gone to the dogs. Whether you are shooting dogs, cats or parakeets, you'll want to prepare for the unexpected. Make sure you have extra batteries, a tripod and plenty of pet treats. Also, do not underestimate the power of perfect timing. Don't plan a Christmas pet photography session when your furry pal is tired or hungry. Rather, choose a time when your pet is relaxed and well-fed. Before you volunteer to photograph your cousin's pet snake, do some research on the animal. Don't go into the shoot thinking that a slithering snake is going to react to a camera the same way a playful puppy would. Regardless of the type of pet, maintain a laid-back attitude. You do not want to upset or scare it, especially if you are wielding a large DSLR camera. If your pet is anti-costume, then select a cute holiday-themed collar or a silly Christmas hat for him to wear. 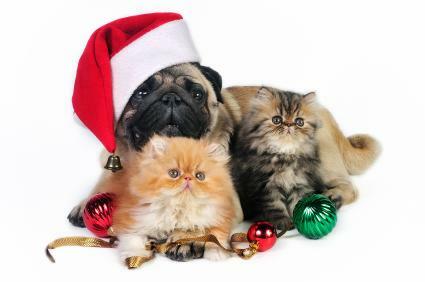 If you plan to photograph a caged pet, such as a fish, bird or reptile, then decorate his home with candy canes, wreaths, tinsel, garland or simple Christmas tree ornaments. After all, even if your pet hamster can't don a Santa hat, there's no reason his cage can't get decked out for the holiday photo shoot. If Fido is sporting a new Christmas sweater and a jingle bell necklace for his holiday photo, keep the background as basic as possible so as to not distract from the star subject. An uncluttered background, such as a solid colored quilt or a blanket of snow, is more visually appealing than a busy one. Plus, it keeps the photo recipient's eyes on your pretty pet. When shooting Christmas photos of your pet, be sure to flood the scene with natural light. You want to resist using your camera's flash, so as to avoid pet photo flash eye. Rather, consider taking the Christmas photos of your pet outdoors. If you are limited to an indoor area, open doors and windows to allow in as much natural light as possible. If the area is still too dark, then turn on lamps and overhead lights to supplement. Mistletoe: Set up your camera on a tripod and enable the self-timer, then jump under the mistletoe with your furry friend and smooch for the camera. Gifts: Take shots of your cat unwrapping gifts and playing with colorful ribbon. Snowman: Build a headless snowman, and then place your dog behind it, so that his head sits on top of the snowman's shoulders. Nativity: Dress your pet as one of the animals found in the Nativity scene. Holiday lights: Dress your pet in a Santa costume and wrap him in holiday lights. Cat Christmas: Place your cat in front of a decorated Christmas tree in an elf costume and snap away. Then, feature the photo on your holiday greeting card with the caption: "Have a Meowy Christmas!" If you have an especially uncooperative pet, don't give up on the photo shoot. Instead, employ photo editing software to make hilarious pet Christmas cards. You can easily Photoshop a holiday hat on a stubborn dog or place a mock letter to Santa in your furbaby's mouth. Photo editing software programs will also allow you to enhance mediocre shots of your pet. All it takes is a few mouse clicks to add funny Christmas-related captions, titles and borders that will make a holiday photo to remember.